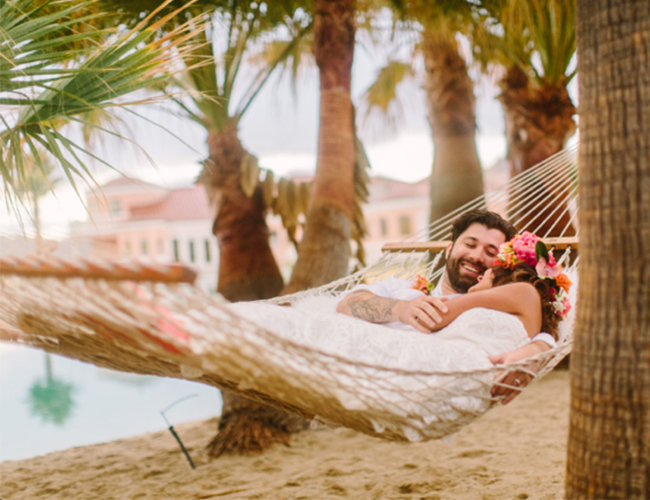 The beauty of this shoot on the wedding blog today lies in the details – every last one of them planned to perfection – oh and the dreamy Caribbean setting! 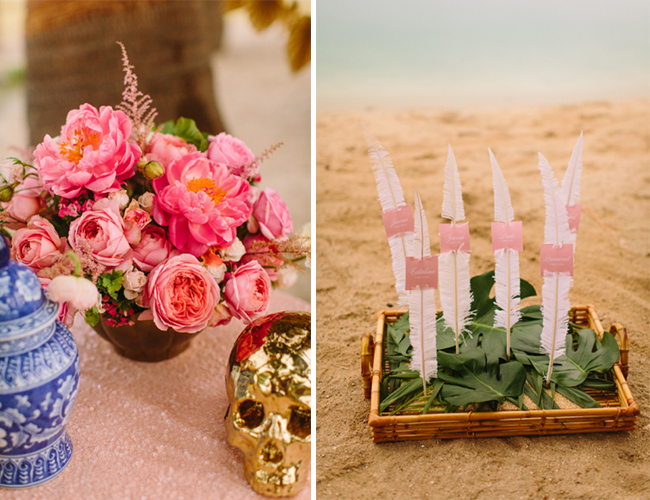 Come rain or shine, Lovelyfest Events didn’t let the weather stop the wedding, but embraced laid-back island vibes and created some seriously amazing Boho wedding inspiration. We decided to take the challenge of a cultural wedding inspirational shoot and use it to do something we’ve never done before. 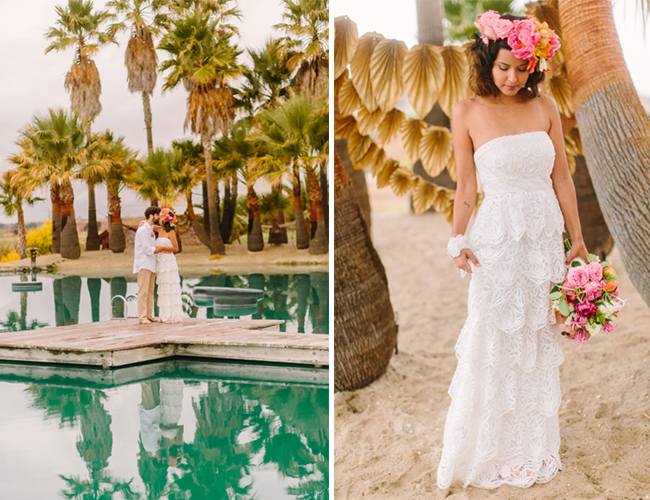 This shoot really took us out of the mundane, rustic, burlap and lace weddings we’re used to on the central coast of CA, and we were really excited to go out of the box! We chose the Caribbean to be our location, St. Nevis to be exact. 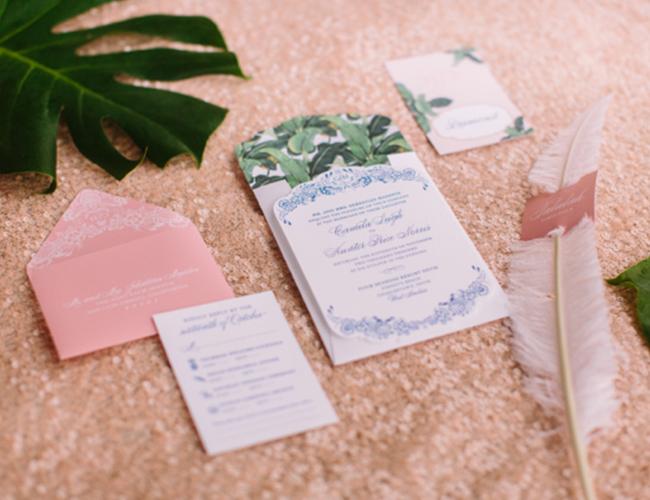 Each detail was thought of in the making of this shoot, even the invitations were custom designed and printed with the wedding location being Four Seasons in St. Nevis. 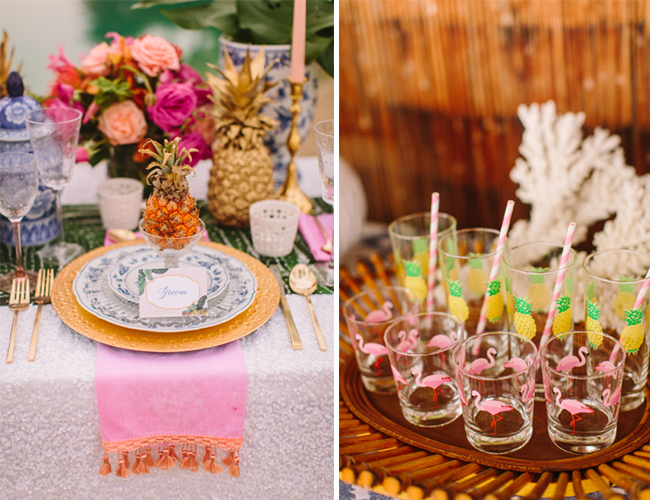 We decided since we didn’t want thisto be a kitschy, tiki wedding, that we’d incorporate two things to our traditional Caribbean theme: a bohemian vibe and French Colonial accents. Sequin tablecloths complimented the abundance of decor pieces that lined the tables, keeping with the bohemian theme. 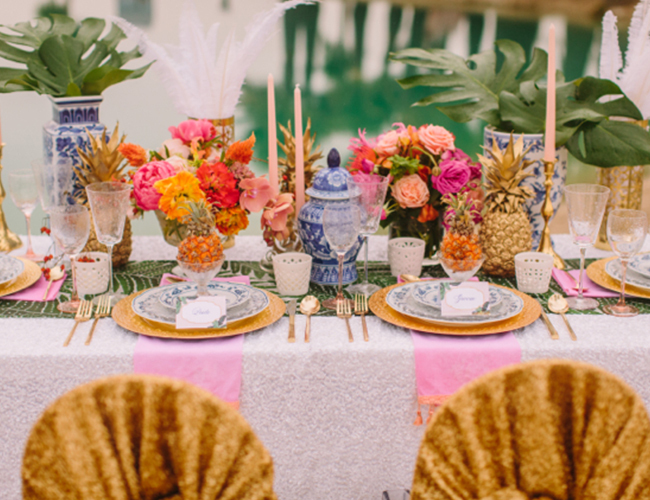 Some decor pieces we had included a skull, palm fronds, traditional blue and white pottery, shells, fringe, tassels, ghost chairs, feathers, gold pineapples, mini pineapples, and tall candlesticks. 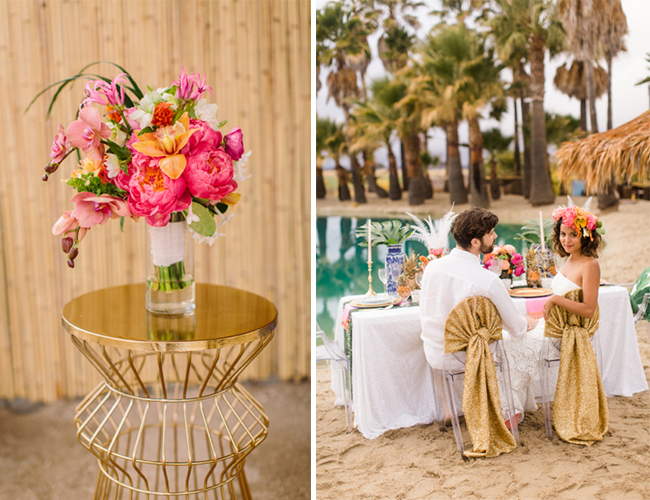 We used palm frond fabrics in the pillows and runner, hand-dyed the napkins an ombre pink, and added fringe for more of a Caribbean feel. 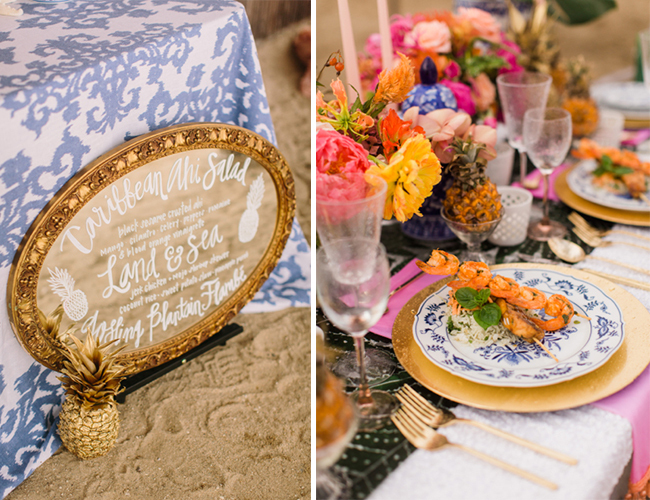 The blue and white china and pottery add in the French Colonial aspect of the Caribbean, and the juxtaposition of all the decor pieces really makes it a bohemian wedding. The location of our shoot, Star Farms, is a paradise in the middle of corn fields, and looks strikingly similar to the Caribbean. A pond with the same turquoise waters of the Caribbean is lined by white sand and dozens of palm trees. 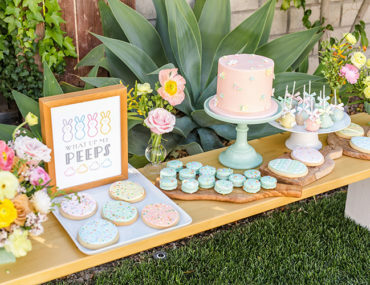 For our color palette, we took inspiration from both the bright and pastel colors seen in the Caribbean through their houses, clothing and food.We used pinks, peach, green, white, blue, and accents of gold to make it all come together. 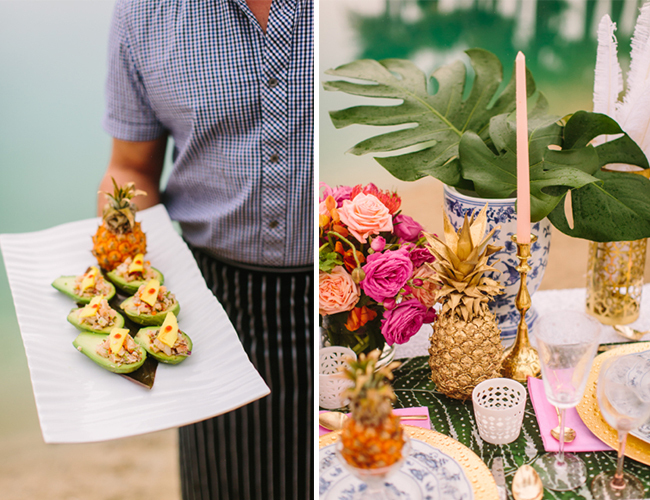 Our caterer, Tracy, prepared traditional Caribbean food at the site, including a colorful ahi salad, shrimp and chicken skewers, and a plantain flambé dessert. The colors of the food played off nicely with the bar setup under a tiki hut and also on the table with the blue and white pottery. 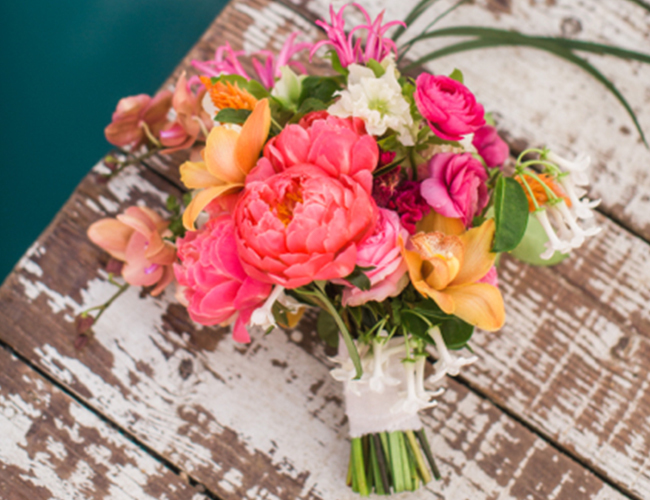 It felt very Caribbean, with the Bride and Groom at the table by the water, and the food being prepared steps away under a hut! It was raining throughout the shoot, which we decided added to the authenticity of being in the Caribbean, where random showers happen on sunny days! 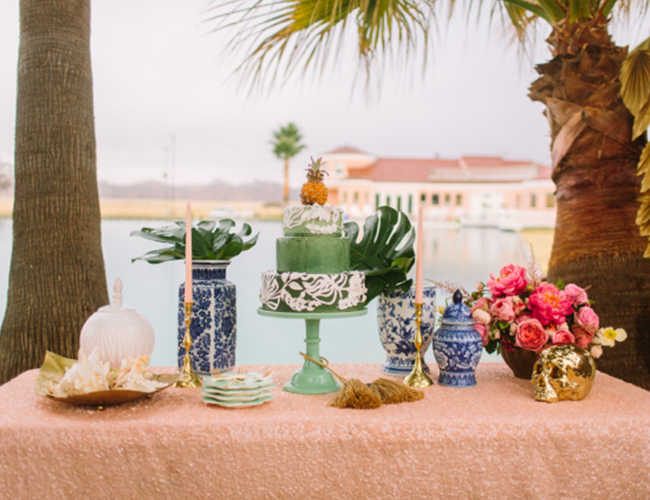 The turquoise water, palm trees, rain drops on the glasses, blue pottery, and tropical flowers made us all want to take a trip to the Caribbean so we could experience a real wedding just like this one! The bride’s gown, one of the newest from BHLDN, has scalloped layers of ivory embroidered lace which popped against the dark skin-tone of our model, Danielle. 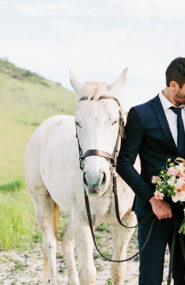 We chose Danielle because we knew her gorgeous, exotic look would simply make the photo shoot. 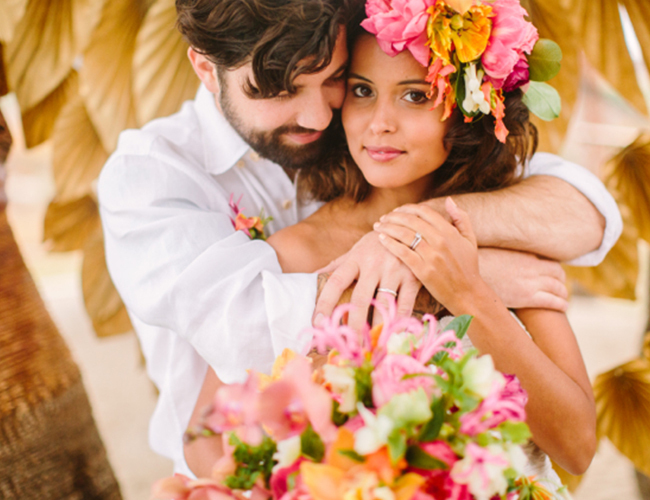 She wore a lush floral crown made of various bright tropical flowers and carried a similar bouquet. 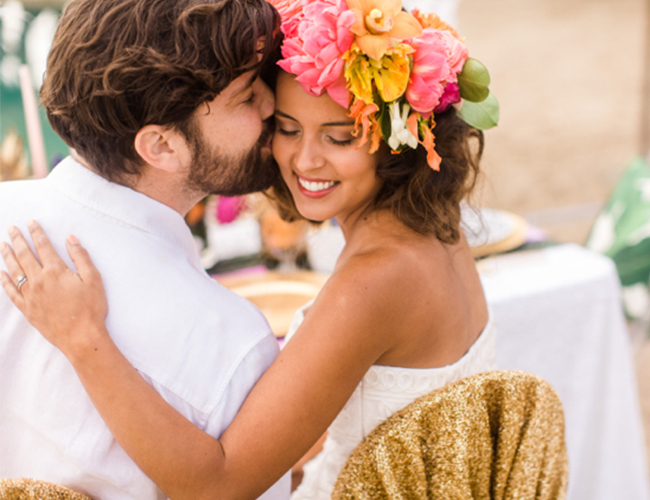 She is boho at heart and she and her husband pulled off the carefree in love attitude that’s necessary when getting married in the Caribbean. The pineapple accents are so fun! Love all the color! Would be such an easy DIY! Isn’t it gorgeous!? 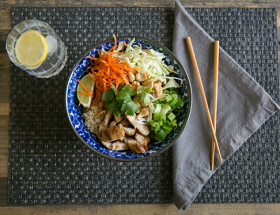 And just a little bit different, we love that! Those linens are kind of awesome!! Right!? 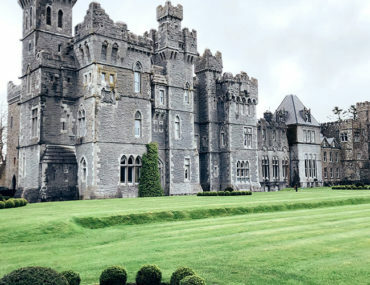 We want to go so bad! Can you believe it’s in CA?! 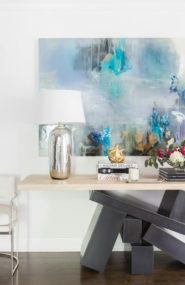 The colors in this shoot are beyond beautiful!!! !